Looking for a little refreshment on a hot summer’s day? Or are you just in the mood for a scrumptious, healthy and refreshing snack? The let your lips embrace this surprising yoghurt ice cream! Remove as much moisture from the yoghurt as possible to avoid the formation of too many ice crystals in the freezer. Put the leaked yoghurt and the honey in a blender. Blend very fast to avoid it becoming too soft. Put the mixture in a bowl and leave it in the freezer for a maximum of two hours. 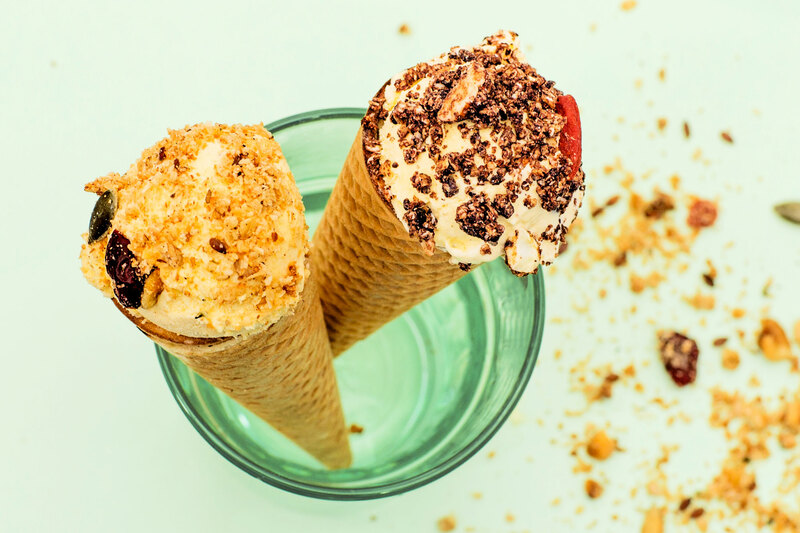 Put a couple of scoops on a cone and dip it in your favourite granola! Tip! Eat this frozen yoghurt ice cream the same day you made it. That’s when it’s at its best!